In its day, the Titanium PowerBook G4 (or TiBook) was the most successful PowerBook sales-wise Apple had ever offered. 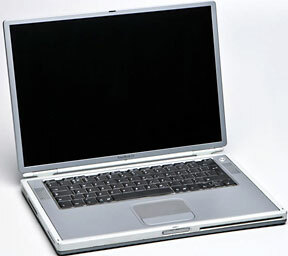 Built from January 2001 to September 2003 in the same form factor, at the time it was the longest-running PowerBook model. Or was it? While the looks barely changed in its 32 months on the market, the later-revision TiBooks were very different machines inside from the “one more thing” Steve Jobs unveiled in his Macworld Expo keynote in San Francisco in 2001. The clock speed had doubled – more than doubled for the entry-level model. So had hard drive capacities. The system bus was 33% faster on the later machines. The video RAM had octupled (eight times as much), and there was a much more powerful and capable graphics processor. The later-version 15.2″ TiBook displays had a higher resolution, and there was a CD-RW/DVD-ROM Combo drive standard and a slot-loading SuperDrive DVD burner available. FireWire throughput had improved dramatically, there was gigabit ethernet, and an analog audio sound-in port has been restored. In short, the late revision TiBooks, aside from their looks, are radically different products from the first and second generation TiBooks, but since they all looked pretty much the same, it is a bit tricky to keep them all in perspective without a guide. This article is intended to be such a guide. The original TiBooks owed a great deal to their immediate predecessors, the G3 Pismo PowerBooks, in terms of under-the-hood engineering. They share with the Pismo its basic motherboard architecture, its 100 MHz system bus, it’s relatively slow FireWire throughput, and its Rage 128 graphics with just 8 MB of video RAM. The biggest distinctions are the 1″ slim metal case, bigger screen, and, of course, the G4 processors, which retain the Pismo’s 400 MHz and 500 MHz clock speeds. Actually, the 15.2″ 1152 x 768 display had the same 91.1 dpi pixel density as the Pismo’s 14.1″ 1024 x 768 screen, with some extra real estate added on the side. The TiBooks painted titanium case was a mixed success at best, with problems of paint chipping, blistering, scratching, and wearing off much too early, AirPort wireless performance issues, and astronomically expensive repair costs. The lack of expansion bays and only one FireWire port are also shortcomings, not to mention cooling issues partly related to the cramped conditions inside the razor-thin case. There was no expansion bay, but happily, there’s still a PC Card slot, so that expansion avenue is still open. Compared with Pismo, the PowerBook dropped from two FireWire ports to one. These original TiBooks came with 128 MB of standard RAM on the low-end model, and 256 MB on the high-end machine. The Ti uses PC100 RAM but only supports up to 1.5″ low-profile DIMMs; it ships with a 1.25″ DIMM installed. The low-end machine’s 10 GB hard drive is quaintly small by current standards, only matching the iBook, which sold for half the price. The original Ti offered the same 10, 20, or 30 GB 4200 RPM hard drive options as Pismo and supports drives up to 12.7 mm in thickness. The original Ti’s slot-loading DVD-ROM drive functions as a 24x CD-ROM or 6x DVD-ROM and is capable of reading both DVD-RAM and DVD-R. The computer has two USB 1.1 ports (none of the Titaniums had USB 2.0) and an IrDA infrared link capable of transferring data at up to 4 Mbits per second. An 802.11b AirPort wireless LAN module is available as a configure-to-order option or as a user-installable upgrade. The first Ti’s internal bus speed ran at 100 MHz, but it was a new pipelined system bus more efficient than the bus on G3 ‘Books. The new bus design, called MaxBus, allowed for much greater efficiency of bus utilization than was possible with the previous design. The Mercury TiBook features the Motorola MPC7410 (“Nitro”) G4 microprocessor running at 400 and 500 MHz – and “detuned” for lower power consumption. The MPC7410 supports up to 2 MB of external L2 cache. These early Tis have no analog (PlainTalk) audio-in port and depend on digital audio input via the USB or FireWire ports, meaning a much narrower choice of potential microphones, although there is also a built-in microphone. There are built-in stereo speakers. There is an autosensing 10/100 Base-T ethernet port that will switch from straight to crossover when it is plugged into another Mac likewise equipped. To connect with older Macs, a crossover cable will still be required. All Tis have a single battery bay. The original battery uses lithium ion cells and provides 50 Watt-hours at 16.6V (full charge). On 2001.10.16, Apple released the first major TiBook upgrade with faster processors, higher speed graphics, and larger hard drives with PowerPC G4 processors up to 667 MHz, a new system bus running at 133 MHz (only on the 667 MHz model), new ATI Mobility Radeon AGP 4x graphics with 16 MB of VRAM, and built-in gigabit ethernet networking – the first time ever in a portable. The entry level model was bumped to 550 MHz, but the 100 MHz system bus of the first gen TiBook was retained on that model. Both models got the new graphics engine with faster 3D rendering with the ATI Mobility Radeon graphics processor with AGP 4x support and 16 MB of video memory, which is sufficient for basic Quartz Extreme support. The new 667 MHz PowerBook G4 came standard with both gigabit ethernet and AirPort wireless networking preinstalled. The 550 MHz PowerBook G4 also included gigabit ethernet and the ability to add AirPort wireless networking as an option. The original 550 MHz PowerBook G4 sold for $2,199 and included 128 MB of RAM and a 20 GB Ultra ATA/66 hard drive. It was AirPort ready with integrated antennas and card slot. The 667 MHz PowerBook G4 sold for $2,999 and included 256 MB of RAM, a 30 GB Ultra ATA/66 hard drive, and AirPort. These were the last PowerBooks with a built-in VGA video port; future models would instead use DVI for external video. Note: In mid- December, 2001, the Onyx models were upgraded with standard slot-loading Combo DVD-ROM/CD-RW drives, and the 550 MHz machine’s price was bumped to $2,299. Value: The 667 MHz Onyx TiBook is the watershed model that introduced the second generation Titanium PowerBook. It is more desirable than the 100 MHz system bus models – especially the Combo drive version – and a fair price for a good one would be in the $300-400 range [when this was first published in 2008], although you might find one for less. On 2002.04.29, Apple once again upgraded the Titanium PowerBook G4 line, this time with a higher-resolution display, 667 MHz and 800 MHz G4 processors, an integrated Digital Visual Interface (DVI) port, and a 133 MHz system bus on all models. With Quartz Extreme coming in Mac OS X 10.2 Jaguar, the Ivory PowerBook G4 line also was equipped with an ATI Mobility Radeon 7500 graphics processor with AGP 4x support and 32 MB of DDR video memory. The enhanced 15.2″ display has a resolution of 1280 x 854 pixels at 101.4 dpi – 23% more pixels than the previous TiBooks’ 1152 x 768 at 91.1 dpi, along with greater brightness and better color saturation. The integrated DVI port can support either Apple’s ADC digital interface for the contemporaneous Studio and Cinema LCD external monitors and DVI-equipped digital projectors, or standard VGA (with the proper adopters). The TiBook form factor remained constant, with only Ivory’s elimination of the IR port and restoration of an analog sound-in port (last seen on the Pismo G3 Series ‘Books), as well as a DVI video port replacing the VGA port on earlier TiBooks. The 667 MHz PowerBook G4 sold for a suggested retail price of $2,499, and the 800 MHz model retailed for $3,199. Comment: These machines will run Mac OS X up to 10.4 Tiger very smartly and have full Quartz Extreme support with their ATI Radeon 7500 video card, plus the higher-resolution 1280 x 854 15.2″ screen. Price range of one in good working order was $375 to $500 in 2008. On 2002.11.06, Apple released the fourth and last major TiBook version with the psychologically significant 1 GHz threshold having finally been achieved in an Apple laptop. Also new were a slot-loading, DVD-burning SuperDrive, a Radeon 9000 video card, 64 MB of video RAM, and a 60 GB hard drive on the high-end unit, with significant price reductions from the previous Ivory models as icing on the cake. They were also the first laptops to include a 1 MB level 3 cache and are the oldest PowerBooks that officially support Mac OS X 10.5 Leopard. They were also the very last PowerBooks that could boot the Classic Mac OS. For those who had been waiting for the availability of a slot-loading SuperDrive in a PowerBook, it was now available. AirPort enabled with integrated antennas and preinstalled AirPort Card. Additional build-to-order options for the PowerBook G4 included up to 1 GB of RAM, Bluetooth, an AirPort Card, and up to 60 GB hard drive. 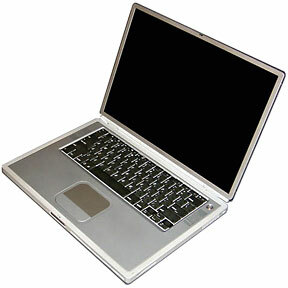 The TiBook had developed into mature product in the context of computer production runs with the Gigahertz model. However, consider that you can get an aluminum PowerBook (especially the 12″ 867 MHz and 1 GHz models) for the same prices or less. I have to concede that the Titanium PowerBook is not one of my all-time favorite ‘Books. It has a reputation of being relatively fragile and somewhat finicky. An acquaintance who refurbishes and resells used Apple laptops once noted that at the time of our conversation he had total of six PowerBook G3 Pismo logic boards for scrap that had controller or logic based issues (i.e., not physically damaged), but by comparison had 30-40 Titanium PowerBook logic boards in the scrap bin. Then there were the too-easily broken lid hinges, RAM slot failures, paint chipping and wearing off, and difficulty replacing or servicing display screens. However the last-revision TiBooks in particular can still be useful, decent-performing machines, and they do have that advantage of being able to boot OS 9 for those of us so inclined. Over the years I’ve heard from numbers of satisfied TiBook users, as well as from some not-so-satisfied ones. If you can find a nice one and treat it gently, it could be a light to medium-duty workhorse, although if you’re thinking of running Leopard, that 1 GB RAM ceiling is a caveat. I would suggest an AlBook or one of the faster G4 iBooks instead.